As a book ambassador for Little, Brown and Company, I’m lucky enough to get to read some of the upcoming releases from them and their imprints prior to their release. Mrs. by Caitlin Macy is from Lee Boudreaux Books and will be released in February 2018. 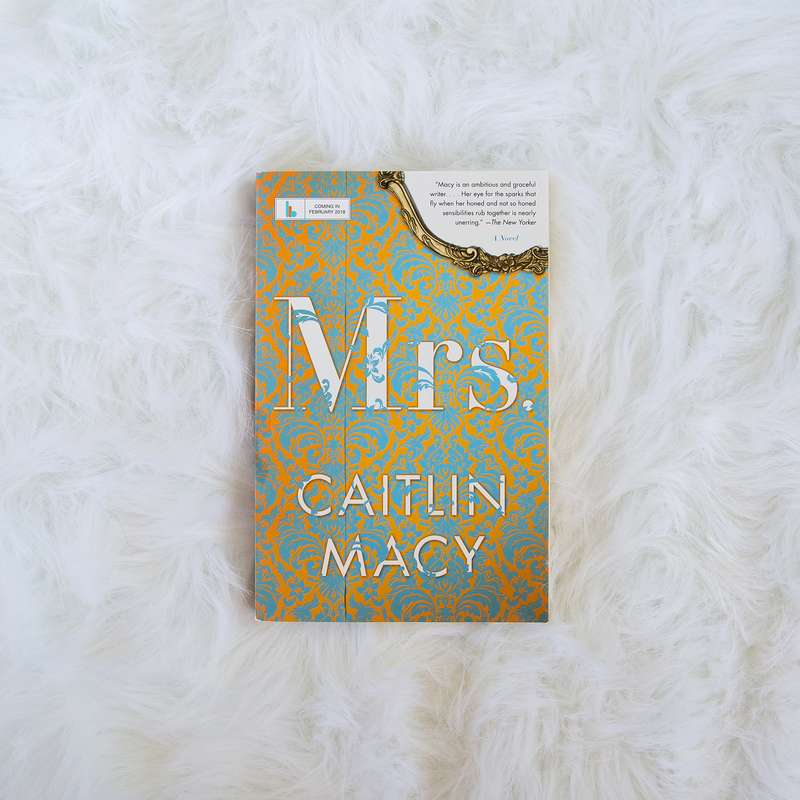 Mrs. by Caitlin Macy takes readers into the world of several upper-middle to upper class families in New York City in the year following the financial crisis of 2008. While the wives shuttle kids back and forth to an exclusive preschool, play dates, and extracurricular activities, the husbands manage hedge funds and banks, prosecute insider traders, and try to prove themselves in a shaky financial climate. Although the chapters switch their focus from character to character, the plot unfolds primarily through the story of Gwen and Dan Hogan. As Dan investigates the father of one of their daughter’s classmates for insider trading, he and Gwen uncover deeply hidden secrets of those they encounter in their highly competitive and judgmental circle while also dealing with the effects their lives and choices have had on their marriage. The last 1/3 of this book absolutely saved it for me. I will admit that during the first half, I almost gave up on this book several times. The narrative style took some getting used to, to be honest, and I found myself frustrated with the characters for their choppy conversational style. They were always talking to one another without ever being clear what they were talking ABOUT, and I had a hard time following them. I realized later in the book that this was probably intentional on the author’s part in order to highlight the superficiality of their relationships and conversations with one another. My biggest problem with the book, however, was how disconnected I felt from the world of the characters. I did not understand most of the financial terms, and I still have no idea what a hedge fund is. As a result, I spent half the book wondering what Dan Hogan was even investigating. Someone more familiar with banks and stocks and all that jazz would probably catch on much more quickly than a little country girl like myself who knows nothing about the stock market. Once Phillipa Lye’s story started to become more clear and Gwen revealed a bit more about her own past, I found that my attitude toward Mrs. changed completely, and I couldn’t stop reading. Caitlin Macy did a wonderful job of revealing the character’s motivations bit by bit and in such subtle ways that the reader isn’t quite sure that a big secret has been revealed until a sentence later when the information finally processes. By switching the focus from chapter to chapter, Macy was able to retain the walls the characters had built between one another while allowing the reader to climb over them, with the exception of Phillipa Lye. True to her character, Phillipa’s walls were not even torn down for the reader, and instead, bits and pieces of her character are revealed through the others’ observations of her and the chapters from her oldest daughter Laura’s perspective. During the last 1/3 of the book when Phillipa begins showing others her pain, Mrs. was redeemed for me. I finally found myself making the emotional connections to the characters that were missing in the first half and had only started showing traces of revealing themselves in the space between. Ultimately, Mrs. covered much more than I can even process for a short review. The commentary on female relationships, the power of one’s past, and the effects of living in an increasingly competitive culture were all there, plus more. If readers can work their way through the groundwork laid in the first half of this book and find a way to connect with the characters and invest in their stories, this is a worthy read, for sure. Posted in FictionTagged book review, Fiction, lee boudreaux books, literary fiction, little brown and company, mrsBookmark the permalink.